Mark (M) is a Duke alum, class of 1986. Benay (B) is a Stanford alum who has had to put up with countless Duke basketball games over the years. They are the proud parents of Miles, Pratt class of 2020. When and how did you learn about DukeEngage? M: I first learned of DukeEngage about eight years ago from someone in the development office who was updating me on new things happening at Duke. At the time, I had never heard of any programs like it and was fascinated and excited by it. I had learned the benefits of direct service and am a strong believer that everyone should spend time serving someone other than him or herself. I love the idea of giving students the opportunity to learn the benefits of service early on. I began supporting DukeEngage as soon as I learned about it, long before I had any idea that one of my sons would be able to take advantage of the program. B: For years, as a non-alum, I tried to keep my respect for Duke under wraps. However, when Mark told me about DukeEngage, it was impossible not to get excited about the creative commitment to civic engagement and service Duke was launching. Both Mark and I have been involved with international development, environmental justice, and social responsibility activities for a long time. DukeEngage was right up our alley and reminded me of some of the activities I had undertaken as a college student and recent grad. It was easy to want to get involved. In what ways do you think the program influenced your son? M&B: Miles participated in the Tanzania program last summer (2017) after his freshman year. As with any truly impactful life-event, which I believe his DukeEngage experience has been, the effects have only just begun to be revealed. However, there are a few influences we have already observed. The program has improved his problem-solving abilities and given him additional confidence when dealing with difficult situations. 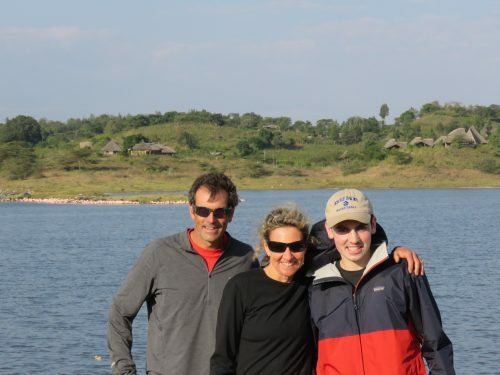 We had the opportunity to visit him in Tanzania this summer about halfway through his nine-week program, and it was immediately apparent to us that he was already able to get by in an incredibly different culture and language. The Tanzania program places the students in hospitals around the country in teams of two or three and the students repair medical equipment in the hospitals. Finding the correct parts to fix the equipment is a huge challenge and the students are regularly forced to employ plans B and C in order to fix the equipment without access to the desired part(s). We also think Miles has gained a sensitivity toward different cultures, now really knowing people from Tanzania. Do your own experiences with travel and service connect with the DukeEngage mission? Please describe. M: Absolutely. My travel and service experiences have often placed me outside of my comfort zone, which in turn have presented me with some incredibly meaningful opportunities for personal growth and fulfillment. This is greatly amplified when I am doing work that benefits the community I am serving. I probably did not realize this, however, until I was in my 30s. I love that DukeEngage provides the students with opportunities not just for the personal growth and fulfillment, but they are able to provide real help to the communities they serve. B: Yes. I find traveling encourages respect and humility because I see the world from another vantage point with all of its challenges, limitations and benefits. Immersing yourself in a new culture also helps you understand how others solve problems and view outsiders. I am always invigorated and inspired after traveling, and also humbled. My experiences with service are similar. They give me a chance to understand, empathize and appreciate from a different perspective. Problems may look easy to solve when you are on the outside looking in, but working side by side with others, the solutions may be more difficult to determine, but they are also more fulfilling to realize. In what ways do you hope your financial support will make an impact on Duke undergraduates? And on Duke? Our hope is that every Duke student has the opportunity to participate in a DukeEngage program. We have been so impressed with the DukeEngage alums we have met. Some now work in the nonprofit sector where they may not have prior to their experience. Some are working in the for-profit sector, but with an added sense of community service and awareness. We would like to see that amplified across all the Duke graduates.